Working can be pretty tough. A-1 Pictures is rolling out another slice-of-life comedy anime, and this time it focuses on the working life of employees at a ward office. For you of those who don’t know, Servant x Service is an adaptation of the manga (of the same name) written by Karino Takatsu, who also created the Working!! series. Right as the episode starts, we are given an energetic and catchy opening song with several scenes of a chaotic, but fun office. Afterwards, we are introduced to our four main characters, three new employees and their supervisor. The first employee who appears to be the main character of the anime goes by the name of Lucy…Yagami (voiced by Ai Kayano, who also did Ai from OreShura). The next employee appears to be a relaxed and comedic guy by the name of Yutaka Hasebe (voiced by Tatsuhisa Suzuki). The last new employee is a nice, but somewhat fragil girl named Saya Miyoshi (voiced by Mai Nakahara). Finally, we have the supervisor, Taishi Ichimiya, who appears to be somewhat of a pushover. Quite an interesting cast of characters we have here. The comedy of this series lies in the interactions of the new employees as they try to get accustomed to their new jobs. As civil servants in the health and welfare section, the three have to get used to answering questions and talking with other people. 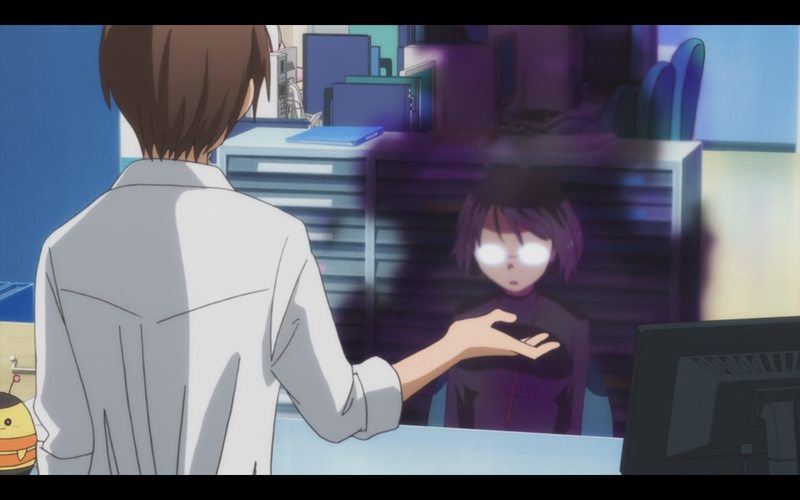 Yagami is paired up with another employee by the name of Megumi Chihaya (voiced by Aki Toyosaki) on her first day. 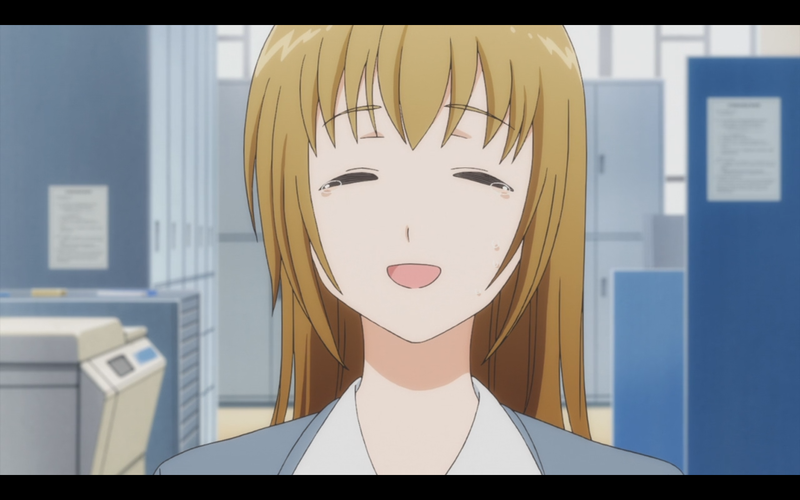 Although Megumi is a supporting character, she was pretty funny due to her emotionless and kind of nonchalant attitude. As the episode goes on, we get to see some funny reactions from the characters as they adapt to their situations and eventually meet with one another. 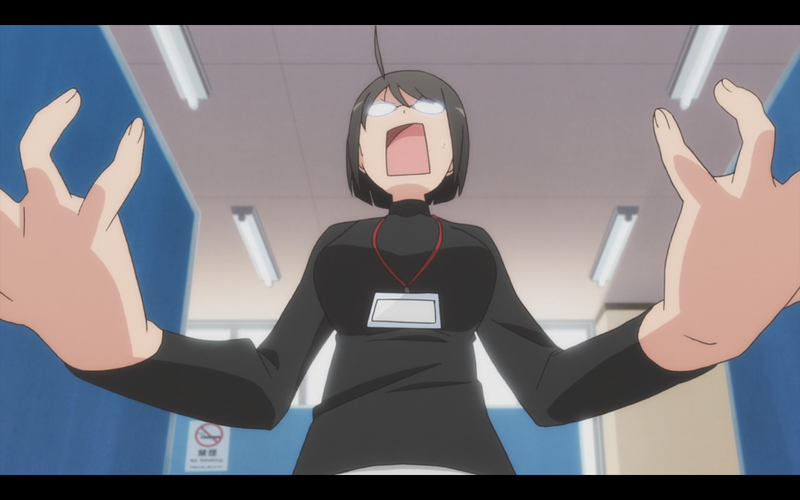 One of the funnier scenes for me was when the supervisor, Taishi, meets up with the new employees and questions why Yagami didn’t put out her full name on a form. Yagami confesses that she couldn’t do that since her name is actually ridiculously long thanks to her indecisive parents. Her full name is actually Lucy Kimiko Akie Airi Shiori Rinne Yoshiho Ayano Tomika Chitose Sanae … Yamagami, but everyone just calls her Lucy for convenience (and I will too). Anyways, Lucy then explains that her main motive for working in civil service is to track down the careless man who approved her ridiculous name and seek revenge. 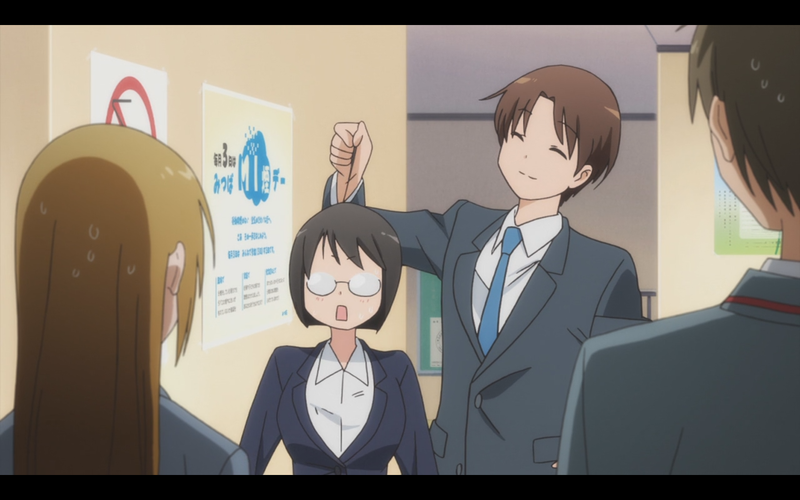 Afterwards, we have several funny interactions between Hasebe and Lucy before the episode ends. Aww, maybe she’ll get to do a bit more next time.